Oh Freedom! offers a new introduction to the Civil Rights movement through the unique lens of Smithsonian collections. Drawing connections among art, history, and social change, Oh Freedom! provides educators with tools to help students re-imagine and re-interpret the long struggle for civil rights, justice, and equality in fresh ways. Oh Freedom! compiles and interprets a selection of more than three dozen artworks from the collections of the Smithsonian American Art Museum and The National Museum of African American History and Culture. The Explore History in Art section frames these artworks with artist biographies and a variety of secondary sources (historical artifacts, other artworks, photographs, musical and vocal recordings, and more) that come from the wider collections of the Smithsonian Institution. These sources, along with an interactive timeline, glossary, and other materials, help students and teachers contextualize and deepen the stories revealed by each artwork. 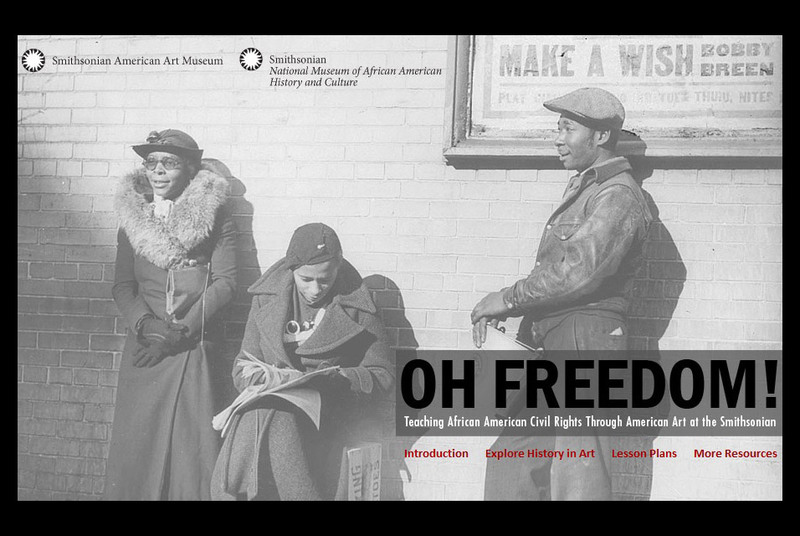 Close readings of these works introduce important civil rights concepts and stories through the visually engaging entry points of paintings, photographs, and prints. Addressing questions of subject matter, style, and the use and display of art, Oh Freedom! ensures that key art concepts are incorporated. Oh Freedom! also reveals the interrelation of art and struggles for civil rights. Abandoning the notion that art and culture merely illustrate history, Oh Freedom! demonstrates that artists and their art participate in, influence, and are influenced by, sustain, argue with, and help people remember social and political movements. With each example, users see that artists and their works both made and responded to history. Finally, Oh Freedom! invites students to grapple with, better understand, and share their own interpretations of artworks and history. Teaching with Oh Freedom! includes tips on helping students interpret works of art. The Lesson Plans section of the website brings teachers together through Web 2.0 tools, which enable them to share lesson plans, activities, and reactions to collected materials, and to discuss how artworks suit particular classroom needs.